Ebola comes to the United States. Hong Kong protesters rally on China's National Day. And the White House fence jumper wasn't the only security breach involving the president last month. First U.S. case: In this age of modern air travel, it was always a matter of when, not if. 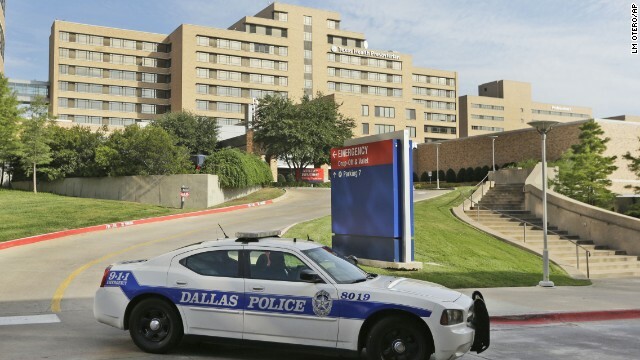 A patient being treated at a Dallas hospital is the first person diagnosed with Ebola in the United States, health officials told us yesterday. The unidentified man left Liberia on September 19 and arrived in the United States on September 20. He is in isolation and under intensive care. The crew that transported him to the hospital has also been isolated. The patient is believed to have had a handful of contacts with people after showing symptoms. A CDC team is on its way to Texas to investigate. The standoff: In China, this is National Day - a day for all Chinese to celebrate the People's Republic of China. Yes, dignitaries gathered and ceremonies took place to mark the holiday in Hong Kong. But the national pride mixed with profound dissent as pro-democracy protesters occupied parts of the Asian business hub - not to celebrate the central government in Beijing, but to denounce and challenge it. Protesters fear that independence is slipping away. They're upset about a recent decision allowing national government leaders in Beijing to vet - in other words, decide who is in and who is out - any candidates up for a vote to lead Hong Kong's government. Hong Kong was supposed to be able to elect their own candidates starting with the 2017 election. UK strikes: Fighter jets from the United Kingdom are getting in on the action, conducting their first airstrikes against ISIS forces in Iraq. The air assaults came four days after Parliament voted to approve the country's involvement. British planes helped Kurdish troops who were fighting ISIS in northwestern Iraq, dropping a bomb on an ISIS heavy weapon position and shooting a missile at an armed pickup truck, the UK's defense ministry said. Security lapses: It looks like there may have been more than one security breach last month involving the President. We all know about the fence jumper who made it all the way across the White House lawn and into the East Room of the presidential residence. Now there's word that an armed private security contractor rode in an elevator with Barack Obama at the CDC in Atlanta, in violation of policy. The Secret Service determined the man wasn't a threat after questioning him. DNA connection: The arrest of Jesse Matthew – the suspect in the disappearance of University of Virginia student Hannah Graham – has resulted in a "significant break" in the 2009 death of another young woman in the same area, police said. Virginia State Police say there is a "new forensic link" between the Graham case and the death of Morgan Harrington, a 20-year-old Virginia Tech student, who went missing after attending a Metallica concert in Charlottesville in October 2009. Her remains were found on a farm months later. Graham remains missing. Investigators think Matthew was the last person with Graham. He is charged with abduction with the intent to defile in the case, according to Charlottesville police. - The protector: Audrey, a fierce Chihuahua pup, loves to attack bubbles. We feel safer already. - Powerslide luxury: Really? This is how you're supposed to use your Rolls Royce Wraith. –Bursting with life: Beautiful slowmo photography by Derek Salvatore. –Yikes: A guy in a wingsuit narrowly escapes a collision with a gondola in China. 5 Things To Start Your Day: Deadly virus, Protests against communism, Terrorists, The President isn't safe and a serial killer. What a great way to start the day! Thanks CNN. We understand, and while some days the news is difficult, there's always the #GoodStuff from #NewDay! What's hilarious is all the Obama haters, who blame him for everything including Ebola (M.Monahan), but then condemn the Secret Service. Given the rhetoric of how bad they think the president is, you wold think they would be happy that his security is lacking. Presidents have been shot and some were even assassinated under the watch of other Secret Service directors. The current USSS director is being attacked by Republicans despite the fact that the President has been kept perfectly healthy. The real issue is that she is a woman, and Republicans are trying to paint her as inherently weak and incapable of doing "man's work." They can't actually say that openly, but their attacks amount to the same thing. The USSS is not perfect, as no federal bureaucracy is. But the USSS has done its job as well as any other agency, and the President has been protected successfully. Where was the outrage from Congress in prior administrations? Or do they think these issues within the USSS are completely new? "Now there's word that an armed private security contractor rode in an elevator with Barack Obama at the CDC in Atlanta, in violation of policy. The Secret Service determined the man wasn't a threat after..." he shot and killed the President of the United States. All kidding aside, what did the Secret Service do after Obama won the election, decide that this president wasn't worth the time or trouble? They show him the same level of respect that he shows the office, none. 4. Is anyone surprised. It's the Keystone Cops show this appears to be the norm for the security detail sad but true. 5. I feel sorry for the families of the girls but how many woman does this guy kill before the cops end his existence. And that ARMED private security contractor should NOT had been in that elevator with President Obama. ANOTHER BREACH OF PROTOCOL. Secret Service questioned him AFTER the fact and determined he wasn't a threat. Keystone Cops where are you? The director of the Secret Service needs to go. It's sickening that that ARMED tresspasser WAS ALLOWED TO JUMP THAT FENCE AND WASN'T APPREHENDED BY THE SECRET SERVICE. Where were they? Inside the UNLOCKED door waiting to greet him and give him the grand tour? What disgusting and deplorable disregard toward the president and his family. I am truly sorry President Obama that there's so much racism, bigotry and hatred toward you. But you rise above it with dignity and grace. I thank you.